Motorists driving down Durban Road in Mowbray in the direction of the Black River parkway cannot help but notice the giant sign advertising the Groote Schuur CID Cleaning Depot situated adjacent to the Mowbray Taxi Interchange. The building is occupied by Straatwerk, the Groote Schuur CID’s appointed cleaning service provider. focus is predominantly along the Main Road, down Durban Road to the railway line and along the Liesbeek Canal and trail. Their ‘upliftment project’ as a job rehabilitation programme achieves two objectives simultaneously. 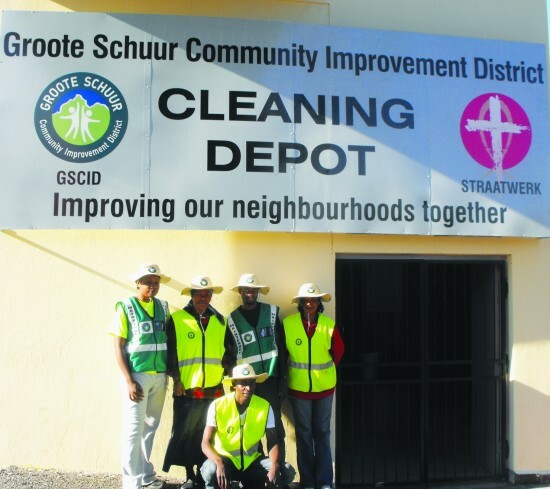 It provides regular street cleaning to the community while providing opportunities for local homeless people to earn cash in hand and improve their living conditions through the programme. This not only provides a source of income but is also aimed at developing and equipping those who enter the programme with ‘employment readiness’, in other words, a first step towards rehabilitation. Ingrid is available for the homeless on a twenty-four seven basis. She works along side the local police and relevant NGOs to assist in profiling the homeless and is responsible for identifying possible solutions to their problems regarding health issues, ID documents, work, shelter and their complaints and concerns. She then interacts with other field workers for possible solutions. Ingrid has a hands-on approach and will at many times be found out on the streets where the homeless are, engaging in and maintaining the trust relationship that she has built up with them over the past two years. For more information or to engage a team of workers, interested parties are invited to contact Straatwerk’s Ophelp operational office on 021 425 0140, 072 607 4508 or hannes@straatwerk.co.za.